Figure 1: Summary of phylogenetic hypothesis in Rouse and Pleijel (2001). Alternative arrangements are discussed in the Discussion of Phylogenetic Relationships. The position of Clitellata/Oligochaeta (includes earthworms and leeches) and Echiura is yet to be resolved. Annelida is a group commonly referred to as segmented worms, and they are found worldwide from the deepest marine sediments to the soils in our city parks and yards. Through most of the 20th century Annelida was split into three major groups; Polychaeta, Oligochaeta (earthworms etc.) and Hirudinea (leeches). Earthworms and leeches are the familiar annelids for most people, but polychaetes comprise the bulk of the diversity of Annelida and are found in nearly every marine habitat, from intertidal algal mats downwards. There are even pelagic polychaetes that swim or drift, preying on other plankton, and a few groups occurring in fresh water and moist terrestrial surroundings. Around 9000 species of polychaetes are currently recognized with several thousand more names in synonymy, and the overall systematics of the group remains unstable (Rouse and Pleijel, 2001). It is now recognized that Oligochaeta and Hirudinea, comprised of several thousand species, form a clade and should be referred to either as Oligochaeta (Siddall et al., 2001) or Clitellata (Martin, 2001). Moreover, it is possible that this group may well belong inside Polychaeta, thus making Polychaeta synonymous with Annelida (McHugh, 1997; Westheide, 1997; Westheide et al., 1999). Echiura (spoon worms), at one time regarded as an annelid group (Sedgwick, 1898), has been excluded from Annelida for many years (Newby, 1940). Evidence now suggests they are in fact annelids (Hessling and Westheide, 2002; McHugh, 1997), though their placement within the group is unresolved. The former phyla Pogonophora and Vestimentifera have also recently become regarded as a single, clearly annelid, group (Bartolomaeus, 1995; Nielsen, 1995; Rouse and Fauchald, 1995), and are now known by the original name, Siboglinidae (see Rouse and Fauchald , 1997 and McHugh 1997). Undoubted annelid fossils, such as Canadia, are known from the Burgess Shale deposits. Until relatively recently the most commonly used system to divide polychaetes was as 'Errantia' and 'Sedentaria'. This was essentially a system of convenience with no real intention of depicting evolutionary relationships. This classification was supplanted in the 1960s and 1970s by ones which split polychaetes into as many as 22 orders with no explicit linkage between them (Fauchald and Rouse, 1997). A recent cladistic analysis of Annelida and other groups has resulted in a new classification of polychaetes (Rouse and Fauchald, 1997), with the group split into two main clades Scolecida and Palpata. Scolecida is a small group of less than 1000 named species, and these worms are all burrowers of one form or another, with bodies reminiscent of earthworms. Palpata comprises the vast majority of polychaetes and is divided into Aciculata and Canalipalpata. Aciculata contains about half of the polychaete species and largely encompasses the old taxonomic group Errantia. Representatives of this lineage are characterized by having internal supporting chaetae, or aciculae, in the parapodia. It includes major groups such as Phyllodocida and Eunicida, which tend to be mobile forms with well developed eyes and parapodia for rapid locomotion. Canalipalpata, a group with more than 5000 named species, is distinguished by having long grooved palp structures that are used for feeding. Canalipalpata is divided into Sabellida, Spionida and Terebellida. Most of these groups’ members live in tubes and use their palps to feed in various ways. The monophyly of Annelida is not well supported and only two morphological features are worthy of discussion; segmentation and chaetae. Nuchal organs represent another possible apomorphy and are discussed in the section on sensory structures (see plesiomorphies and other features). Annelids have three body regions (Fig. 2). The majority of the body is comprised of repeated units called segments. The original French use of the name Annélides (Lamarck, 1802) comes from the Latin word ‘anellus’, meaning a little ring, in reference to the presence of the ring-like segments. Each segment is, in principle, limited by septa dividing it from neighbouring segments, and has a fluid-filled cavity within referred to as a coelom. Structures such as the excretory, locomotory and respiratory organs are generally repeated in each segment. Segments are formed sequentially in annelids and are established during development from growth zones located at the posterior end of the body; so the youngest segment in the body of an annelid is always the most posterior. The only parts of the annelid body that are not segmental are the head and a terminal post-segmental region called the pygidium. The head is comprised of two units, the prostomium and the peristomium. The postsegmental pygidium includes the zone from which new segments are proliferated during growth. The proposed homology of segmentation seen in annelids with that seen in Arthropoda has been used to unite the two as Articulata, a grouping that dates back to Cuvier (1817). The homology of this segmentation has been questioned recently, with arthropods now viewed by many as closer to taxa such as Nematoda (Aguinaldo et al., 1997). This suggests that the form of segmentation seen in annelids may in fact represent an apomorphy. With regards to the supposedly unsegmented Echiura, their reinstatement within Annelida (see McHugh 1997) suggests that their apparently unsegmented body in fact represents a series of fused segments (see Hessling and Westheide 2002). Figure 2. Ophryotrocha (Dorvilleidae). Sandgerdi Iceland. Copyright © 20001 Greg Rouse. A distinctive feature of annelids are structures called chaetae (Fig. 3). Chaetae (also called setae) are bundles of chitinous, thin-walled cylinders held together by sclerotinized protein. They are produced by a microvillar border of certain invaginated epidermal cells and so can be defined as cuticular structures that develop within epidermal follicles. 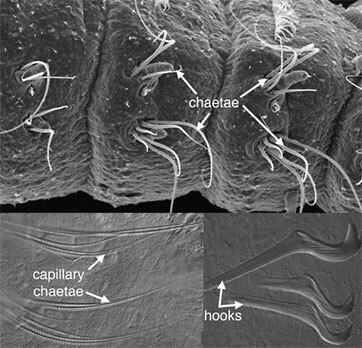 Chaetae show a huge amount of variation, from long thin filaments (capillary chaetae) to stout multi-pronged hooks (Fig. 3). Apart from annelids, chaetae are found in Echiura and Brachiopoda. There is now good evidence (Hessling and Westheide, 2002; McHugh, 1997) that the former group falls within Annelida. The position of Brachiopoda is controversial (Lüter, 2000b; Lüter and Bartolomaeus, 1997; Stechmann and Schlegel, 1999) and the homology of their chaetae with those of annelids is unresolved (Lüter, 2000a). There is a distinct possibility therefore that chaetae represent an apomorphy for Annelida. Figure 3. Proscoloplos (Orbiniidae). Bondi, Australia. SEM and Light micrographs. Copyright © 2001 Greg Rouse. The most recent comprehensive systematization of polychaetes, that proposed by Rouse and Fauchald (1997) from their cladistic parsimony analyses, has been used here (Fig. 1) with some alterations (see Rouse and Pleijel, 2001). Allowing for the likely errors in the placement of many taxa, and the fact that there were conflicting results included in the original analyses, the most fundamental problem inherent in the systematization used here may be that of the placement of the root for any tree of Annelida. Basal annelids, according to Rouse and Fauchald (1997), are taxa such as Clitellata/Oligochaeta and simple-bodied forms within Scolecida. Their trees also excludes Echiura from Annelida. This result was based on outgroup choices such as Mollusca and Sipuncula, and may well be misleading. Alternative hypotheses are therefore worth outlining, though they do not follow normal cladistic practice. Storch (1968), following a detailed study on the musculature of Annelida, proposed that scale-worms, a diverse clade within Phyllodocida, are representative of the plesiomorphic condition for Annelida. He suggested that there was a radiation from this group, but that Chrysopetalidae were most closely related to scale-worms. The implication of his hypothesis is that Phyllodocida represents a paraphyletic group, from which all other polychaete taxa arise. Westheide (1997) (and see Westheide et al., 1999) suggests that the basic (i.e., plesiomorphic) 'body plan' of Annelida comprises features meaning that the root of the Annelida tree would be placed with taxa from Aciculata. This would either result in a paraphyletic Phyllodocida or Amphinomida, depending on which taxon is used as the root (Fig. 4). From a molecular perspective, McHugh (1997) found Clitellata, Pogonophora (= Siboglinidae) and Echiura nested among various polychaetes using sequence data from elongation factor 1 alpha in a parsimony analysis (Fig. 4). The placement by McHugh (1997) of Pogonophora as a polychaete group was congruent with Rouse and Fauchald’s (1997) results, but those of Clitellata and Echiura were markedly different. The conflict between this molecular sequence data and the morphological results could be caused by several factors. One possibility is that Clitellata/Oligochaeta and Echiura have lost a number of morphological features that would help identify their sister group among polychaetes. Further morphological study, combined with sequence data, may uncover these 'losses' (see Hessling and Westheide, 2002). However, the molecular sequence data sets assembled to date have been marked by both a limited number of taxa and characters. An exception is Brown et al. (1999), where DNA sequence data from three nuclear genes across a wide taxonomic diversity of annelids was subject to parsimony analysis. They recovered some morphological groupings such as Cirratulidae, Terebellidae and Eunicida, but did not show a monophyletic Phyllodocida or Aciculata, nor did they find any parts of these taxa to be basal groups of Annelida. However, some expected groupings were not recovered. Martin (2001) found that the placement of Clitellata/Oligochaeta among polychaetes could not be resolved, and he could not recover a monophyletic Annelida owing to the placement of taxa such as Mollusca and Sipuncula. None of the major taxa used here, such as Palpata, Aciculata, Phyllodocida, Canalipalpata, Sabellida or Terebellida were recovered in Martin's (2001) analysis. Also less diverse taxa such as Nereididae, Spionidae and Aphroditiformia were not recovered. Does the fossil record help? In a review of the fossil record of annelids Rouse and Pleijel (2001) suggested that the oldest unequivocal fossil polychaetes, such as Canadia from the Cambrian, belong within Phyllodocida. Subsequent fossil polychaetes that can be confidently placed outside Phyllodocida do not appear until the Carboniferous. No other fossil polychaetes from the Cambrian can be unequivocally assigned to extant polychaete taxa. There are several likely appearances from the Ordovician, including Serpulidae, Spionidae and the radiation of Eunicida. Ensuing appearances suggest that by the end of the Carboniferous most major polychaetes lineages had appeared. The exception appears to be Scolecida, with the earliest known fossils being the dubious Archarenicola (Arenicolidae) from the Triassic, and one assignable to Paraonidae from the Cretaceous. With the rooting option employed in Figure 1, it appears that some of the earliest appearing fossil polychaetes belong to derived clades (e.g., Eunicida and Phyllodocida). This could be interpreted in two ways: (1) the root placement in Figure 1 is wrong, and so Aciculata, comprised of Amphinomida, Eunicida and Phyllodocida, may in fact represent a paraphyletic 'stem' group for the rest of polychaetes; (2) a number of major polychaete clades had already evolved in, or before, the 'Cambrian explosion', but fossils have not yet been found. The third possibility is that the overall topology used in Figure 1 may be profoundly incorrect. If we accept that the basic topology shown in Figure 1 is correct, but do not root the tree, then a diagram as shown in Figure 5 is the result. This may represent the most conservative representation of our understanding of annelid relationships. Bartolomaeus, T. 1995. Structure and formation of the uncini in Pectinaria koreni, Pectinaria auricoma (Terebellida) and Spirorbis spirorbis (Sabellida): implications for annelid phylogeny and the position of the Pogonophora. Zoomorph. 115:161-177. Brown, S., G. Rouse, P. Hutchings, and D. Colgan. 1999. Assessing the usefulness of histone H3, U2 snRNA and 28S rDNA in analyses of polychaete relationships. Aust. J. Zool. 47:499-516. Cuvier, G. 1817. Le régne animal distribué d'après son organisation, pour servir de base à l'histoire naturelle des animaux et d'introduction à l'anatomie comparée. Deterville, Paris. Eibye-Jacobsen, D., and R. M. Kristensen. 1994. A new genus and species of Dorvilleidae (Annelida, Polychaeta) from Bermuda, with a phylogenetic analysis of Dorvilleidae, Iphitimidae and Dinophilidae. Zool. Scri. 23:107-131. Fauchald, K. 1977. The polychaete worms. Definitions and keys to the orders, families and genera. Nat. Hist. Mus. Los Angeles County. Sci. Ser. 28:1-188. Fauchald, K., and G. W. Rouse. 1997. Polychaete systematics: Past and present. Zool. Scr. 26:71-138. Hessling, R., and W. Westheide. 2002. Are Echiura derived from a segmented ancestor? Immunohistochemical analysis of the nervous system in developmental stages of Bonellia viridis. J. Morph. 252:100-113. Jamieson, B. G. M. 1981. The ultrastructure of the Oligochaeta. Academic Press, London. Lamarck, J.-B. d. 1802. La nouvelle classes des Annélides. Bulletin du Muséum d'Histoire Naturelle, Paris An X:Disc. d'ouverture, 27 Floréal (Reprinted in 1907 in Bulletin biologique de la France et de la Belgique 60:56). Lüter, C. 2000a. Ultrastructure of larval and adult setae of Brachiopoda. Zoologischer Anzeiger 239:75-90. Lüter, C. 2000b. The origin of the coelom in Brachiopoda and its phylogenetic significance. Zoomorph. 120:15-28. Lüter, C., and T. Bartolomaeus. 1997. The phylogenetic position of Brachiopoda- a comparison of morphological and molecular data. Zool. Scri. 26:245-253. Martin, P. 2001. On the origin of the Hirudinea and the demise of the Oligochaeta. Proc. Royal Soc. London Ser. B: Biol. Sci. 268:1089-1098. McHugh, D. 1997. Molecular evidence that echiurans and pogonophorans are derived annelids. Proc. natn. Acad. Sci. U.S.A. 94:8006-8009. McHugh, D. 2000. Molecular phylogeny of the Annelida. Can. J. Zool. 78:1873-1884. Newby, W. W. 1940. The embryology of the echiuroid worm Urechis caupo. Mem. Am. phil. Soc. 16:1-219. Nielsen, C. 1995. Animal evolution. Oxford University Press, Oxford. Purschke, G., R. Hessling, and W. Westheide. 2000. The phylogenetic position of the Clitellata and the Echiura - on the problematic assessment of absent characters. J. Zool. Syst. Evol. Res. 38:165-173. Rouse, G. W. 2001. A cladistic analysis of Siboglinidae Caullery, 1914 (Polychaeta, Annelida): formerly the phyla Pogonophora and Vestimentifera. Zool. J. Linn. Soc. 132:55-80. Rouse, G. W., and K. Fauchald. 1995. The articulation of annelids. Zool. Scr. 24:269-301. Rouse, G. W., and K. Fauchald. 1997. Cladistics and polychaetes. Zool. Scr. 26:139-204. Rouse, G. W., and F. Pleijel. 2001. Polychaetes. Oxford University Press, London. Sawyer, R. T. 1986. Leech biology and behaviour. Clarendon Press, Oxford. Sedgwick, A. 1898. A student's textbook of zoology. Swan Sonnenschein & Co. Ltd., London. Siddall, M. E., K. Apakupakul, E. M. Burreson, K. A. Coates, C. Erseus, S. R. Gelder, M. Kallersjo, and H. Trapido-Rosenthal. 2001. Validating Livanow: Molecular data agree that leeches, branchiobdellidans, and Acanthobdella peledina form a monophyletic group of oligochaetes. Mol. Phyl. Evol. 21:346-351. Stechmann, A., and M. Schlegel. 1999. Analysis of the complete mitochondrial DNA sequence of the brachiopod Terebratulina retusa places Brachiopoda within the protostomes. Proc. Royal Soc. London Ser. B: Biol. Sci. 266:2043-2052. Storch, V. 1968. Zur vergleichenden Anatomie der segmentalen Muskelsysteme und zur Verwandtschaft der Polychaeten-Familien. Z. Morph. Ökol. Tiere 63:251-342. Westheide, W. 1997. The direction of evolution within the Polychaeta. J. Nat. Hist. 31:1-15. Westheide, W., D. McHugh, G. Purschke, and G. W. Rouse. 1999. Systematization of the Annelida: different approaches. Hydrobiol. 402:291-307. Annelid Resources: Another can of Worms: Phylum Annelida, polychaetes, oligochaetes, leeches, vent worms, etc. A guide to information on annelids, and current worm research and researchers. Geoffrey B. Read, NIWA, Wellington, NZ. WormNet. Reconstructing the early evolution of segmented annelid worms. Polychaeta Terebellida homepage. Torleif Holthe, Museum of Natural History and Archaeology, Norwegian University of Science and Technology. 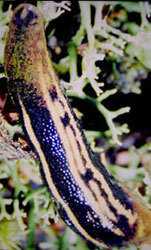 Leeches Hirudinea. Photographed and compiled by Mark E. Siddall and Eugene M. Burreson. Introduction to the Annelida: Everybody's favorite, worms. . . UCMP Berkeley. Center for Annelida Resources. Mark J. Wetzel, Illinois Natural History Survey Center for Biodiversity, Champaign. Taxonomic Information Across The Internet. Darwin Initiative project with a focus on Spionidae, Nereidae, and Eunicida. Superannuated Annelids. 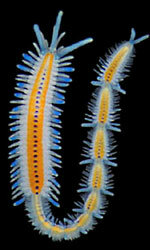 Article about tube worms at cold hydrocarbon seeps. The Why files. University of Wisconsin. Thanks to the Australian Research Council and the South Australian Museum and University of Adelaide for support to GWR. The authors would like to thank Katja Schulz for her help in editing and constructing this page. Page: Tree of Life Annelida. Segmented worms: bristleworms, ragworms, earthworms, leeches and their allies. Authored by Greg W. Rouse, Fredrik Pleijel, and Damhnait McHugh. The TEXT of this page is licensed under the Creative Commons Attribution License - Version 3.0. Note that images and other media featured on this page are each governed by their own license, and they may or may not be available for reuse. Click on an image or a media link to access the media data window, which provides the relevant licensing information. For the general terms and conditions of ToL material reuse and redistribution, please see the Tree of Life Copyright Policies.